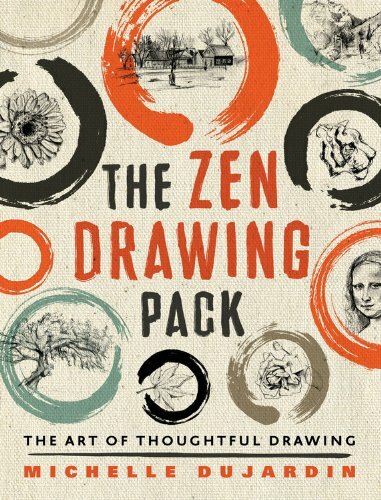 The Zen Drawing Pack is an instructional book that teaches drawing using some of the Buddhism concepts. Many of these concepts get you to relax, go with the flow, to prevent yourself from getting distracted, sometimes to think purposefully, and sometimes to let go. The objective of the book is probably to get you to enjoy the drawing process and not to worry too much about the result. This is actually a two-book pack. The first book is The Miracle of Zen Drawing which talks about Buddhism and Zen. The second book is a journal with exercises followed by blank pages you can draw on. There are also two pencils provided. No sharpeners though. Most of the exercises are contour drawing exercises where you have to observe something and draw. It's about going with the flow. There aren't any technical drawing techniques such as using proportion to get an accurate drawing because the focus is not on getting an accurate drawing. This book's emphasis is on the process of drawing rather than the end result of drawing. I felt that there's overemphasis on contour drawing. There's on exercise that ask you to draw a self portrait, and without any knowledge of proportion drawing, it's not easy to get some likeness. The book even talks about balance, like how you should put in the details, and how sometimes you should make the drawing simpler but in this case, it's always teaching about the latter. For people who are too critical or judgemental about your own work, this book should give you a different perspective to think about. I find it's a form of relaxation going through the exercises. I'm someone who likes to put a lot of details in my drawings so this book also helps me in the sense that I would worry less about the end result and enjoy the moment of drawing.